← Should Bobby D Call it Quits? Started this Sunday deep in a Louisiana bayou just northwest of Nawlins, waking up before daybreak to go hunting with a new buddy of mine – Eddie Parish. 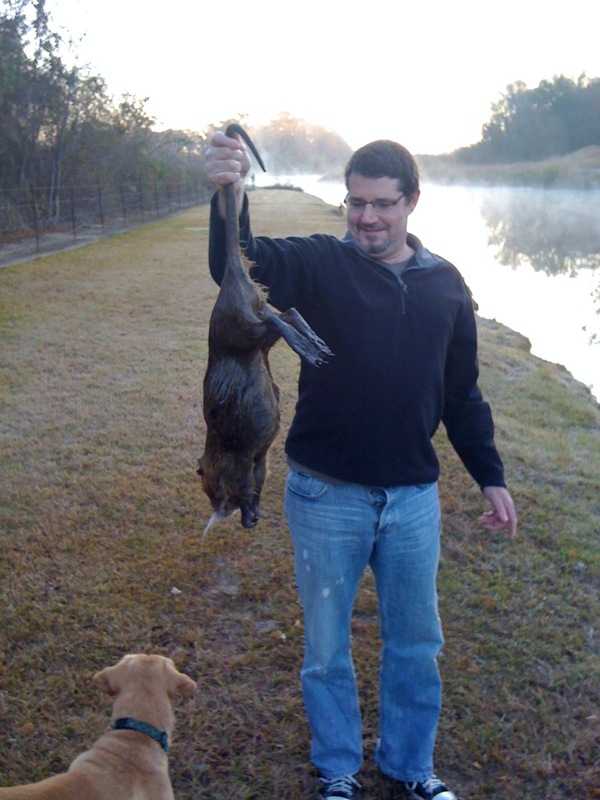 We were after a little band of Nutria (Nutrium?) that had taken up residence in the bayou on his property. You can learn about these little rascals here. The state of LA gives anyone free reign to shot these guys any time you see them cuz they breed like bunnies and are a threat to agriculture. They’ve been known to be vicious. This is the guy I bagged this morning, with Eddie’s dog Francine ready to get at it. The stalking was fun. Shot it right behind the head, killed instantly, just like it was frozen in its swimming pose. I left the other one for Eddie to get tomorrow morning. For any of you feeling sorry for the guy, it has a long nasty rat tail, really just a huge swamp rat. One less Nutria terrorizing the cajun swamps tonight. its not related to a rat. its like saying nutrias have a cute beaver face, therefore they really just smallish beavers. Now I am not a crazed animal right activist. I really don’t like nutrias they defecate all over my property and I pick em off when I can there pelt is kind of soft and there meat is tasty.